The Amazon Picking Challenge is over and two things stood out. One: how many different arm gripper solutions were possible; and two: just how difficult the challenge still is. The gap between the top two teams and the other 26 teams was significant, with Team RBO scoring 148 points, Team MIT scoring 88 points and Team Grizzly next best with 35 points. The Amazon Picking Challenge was developed to spur advancement in fundamental technologies for automated picking in unstructured warehouse environments. This is something that Amazon badly needs to do better in order to fulfill all our e-commerce instant delivery orders. And it’s also something that will enable robots to better work in all areas of our life. Not surprisingly then, there was a lot of excitement at ICRA around the 2 day challenge. One of the conference expo halls was given over to robot competitions. There were 16 bays with a set of warehouse shelves in each. Amazon had announced a menu of common e-commerce items that would be used in the challenge, but before each round the shelves were stocked with a randomized selection of items from the menu and each team was given a order list to fulfill. Each of the 28 teams was given time slots to practice in and then compete. Over the course of 2 days, 28 teams rotated through the competition. It was similar to the DARPA Robotics Challenge, at least the 2013 first round. “Like watching paint dry.” With so much happening at ICRA, I was only able to visit the Picking Challenge for short periods of time. As a spectator, I spent most of my time watching robots do nothing. Large amounts of nothing. Occasionally nothing would be enlivened by an attempt to pick up nothing, or perhaps the shelf itself. Once or twice I saw a real pick get dropped. If I was very lucky, because the competition area was crowded with media, spectators and members of other teams, I might get to look at the laptops running code and showing representations of what the robot was perceiving while it looked like nothing was happening. And the perception was the real event. I talked to Team MIT after they posted their score of 88 points, blowing all previous entrants out of the water. I had particularly noticed their combination of an ABB 2 armed robot with a flat scoop and a suction gripper. When asked if they attributed their success to the end effector or other mechanical solutions, the team gave all credit instead to their perception and path planning algorithms. Ultimately that is the secret sauce that Amazon, and all the other major robot companies, would like to capture; better algorithms for existing robots. The range of hardware in use in the competition was broad. There were several Baxters, Yaskawa Motomans, Universal Arms, ABBs, PR2s, Barrett Arms, custom built 3d printer style rigs and factory automation. There were scoops, hands, grippers, and suction. End effectors were made or covered in a range of substances, wood, metal, plastic, soft silicon. While it might all be about the algorithm, I will point out that the two most efficient teams did both use suction and soft surfaced grippers. A third thing that stood out to me was how many large robotics companies were in the audience of the Picking Challenge, watching. Congratulations to the winning teams – and to Amazon for the support they gave the robotics community for this event. Amazon awarded travel grants to ICRA, arranged practice equipment and a $26,000 prize pool. Participants will be encouraged to share and disseminate their approach to improve future challenge results and industrial implementations. Of 25 teams from around the world, the winner of the Amazon Robotic Bin-Picking Challenge is the Technische Universität Berlin using Barrett’s WAM robotic arm. The Amazon Picking Challenge is the centerpiece of the record-attendance IEEE Conference on Robotics & Automation in Seattle this year. There are 28 teams here from around the globe who have brought their hardware and software to the competition. 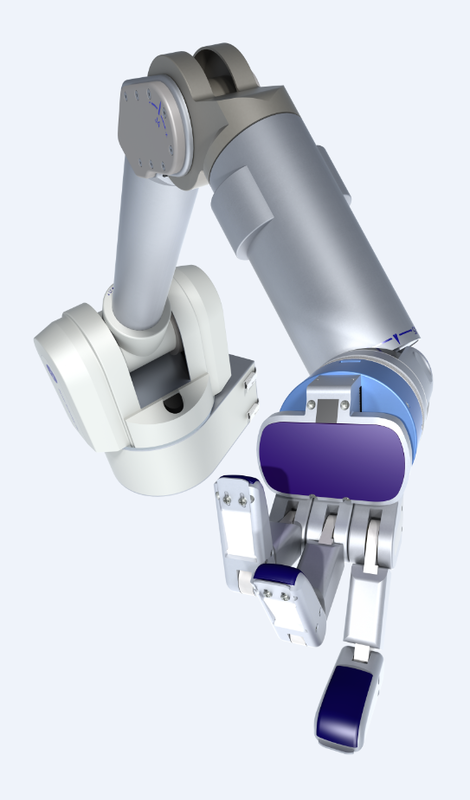 Entries include robotic arms from ABB, Fanuc, Rethink Robotics, Universal Robots, and Yaskawa-Motoman. The competition just finished, and the scores are in Technische Universität Berlin’s Robotics and Biology Laboratory using Barrett’s WAM arm in 1st place at 148 points followed, in 2nd place with 88 points, by the Massachusetts Institute of Technology using an ABB arm and a gripper with creative finger geometries. The 3rd place finisher came in at 35 points. The WAM arm (shown with a BarrettHand).